I was having lunch just a week or two ago with the highly renowned literary agent Robert Lescher. Bob represents people like Calvin Trillin, Robert M. Parker Jr., Matt Kramer, MFK Fisher, and many, many others. He and I were talking about food and wine. The conversation always seems to end up there when we get together. He was reminiscing about the days when he would come up to Dutchess County, and spend time with friends, and visit his friend Ben Feder at Clinton Vineyards. I was perplexed. What would Robert Lescher and Bed Feder possibly have in common? As Bob told me, my eyes widened. I had only known Ben Feder as the grand Old Man of the Hudson Valley wine world. As a fellow farmer and winemaker I was a fan of Ben’s and his was one of the wineries that convinced me that I too should take a chance, and work the valuable and generous soils of this lush valley. Bob explained that for more than two decades Ben and his design group had been one of the most sought after firms in publishing for every big book of the 1950s and 1960s. Editors signaled to their sale force that books were important because the brass had put in for Feder and his team to take the book, design wise, to the next level. His involvement in a project signaled the book’s importance to the company. To some extent, I thought to myself, as only a young man can, Ben Feder was the Chip Kidd of his day. And then after some thinking, it is in fact the reverse, is it not? Ben Feder was a boy from the Bronx who attended DeWitt Clinton. Ben’s father was a cellist with the New York Philharmonic Orchestra under Arturo Toscanini. Ben graduated from the Parsons School of Design and studied painting in Paris and Venice. Ben became a highly prized graphic artist and book designer, whose work was highly sought out. He became the president of Countrywide Properties, a real-estate development and management company in New York. His first two marriages ended in divorce. Ben Feder moved came to the Hudson Valley in 1969, the same year as Woodstock, and purchased a rundown 100-acre dairy farm. He was in his mid-to-late 40s. Ben and the cows didn’t seem to get along. “At the time, though, he lived in New York City where he worked as a graphic designer, spending only weekends at his Clinton Corners home. When a local farmer offered to care for the property in exchange for his pasturing his 36 head of Angus, Feder agreed. Later, Feder acquired the herd as pay-back for a debt owed him by the farmer,” wrote Bonnie Langston in the Daily Freeman in 2008. “Intrigued by making wine, Ben sought advice from fellow winemaker Herman Wiemer who made wine for Walter S. Taylor at the Bully Hill Vineyard and then went off to make his own prize winning Riesling in the Finger Lakes. Advice to Ben was to grow Seyval Blanc, a French-American hybrid grape that does well in the harsh climate of the Northeast. The cows left their pasture and grapes were planted. Ben’s first vintage was in 1977, the year after Gov. Hugh L. Carey put through a farm winery bill permitting small wineries to sell direct to customers, retailers and restaurants,” wrote Langston. 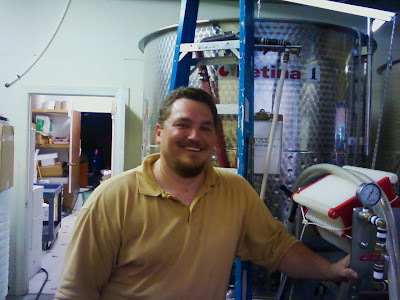 Ben was one of the new, young wave of winemakers, the first farm winery crowd, along with several others. In June of 1989, at Radio City Suite at the Rainbow Room, Phyllis Rich Flood and Ben Feder were married. The ceremony was performed by Rabbi Robert E. Goldburg. Both were divorcees, the two remained wed for 30 years. "Ben was a pioneer and visionary in the Hudson Valley wine industry and will be terribly missed. My deepest sympathy to Phyllis and the family." said Michael Migliore, of the Hudson Valley Wine & Grape Association. I recently saw Ben Feder at the Hudson Valley awards dinner, as we all did, where he was awarded a Life Time Achievement Award for his work in winemaking in the Hudson Valley. He was a pioneer. I did not know him well, but I wanted to say something that was true, that was meaningful, and I think I did. I am in the Hudson Valley because of Ben Feder. Because of what he accomplished. He established a working vineyard farm n the valley, and he made good wine. And because of what he accomplished, he made it a little easier for the next wave of us. "The Wine Blog Search Engine"
A couple of weekends ago, Dominique and I had an absolutely fabulous dinner with David Jackson, his wonderful wife Kathy, and their little dog Islay Bear (A Scottish name for sure). 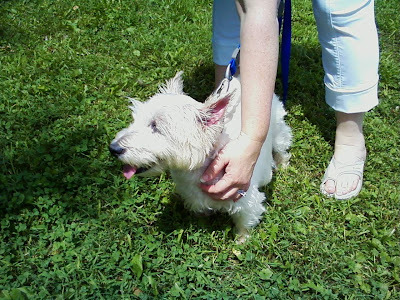 Islay is one of the cutest little dogs you've ever met. And I am truly a big dog guy, but this little guy has such a face, and such a great disposition, that you've just gotta love him. David, a former and sometime IBM-er, is very knowledgable about wines. And when he isn't selling wine up and down the Hudson Valley, runs his own touring company that oversees gourmet wine trips to Italy! David made grassfed Kinderhook Farms London Broil, with a fabulous rub. It was like buttah!!!! He served it with a Querceto Chingnale CabSav/Merlot super Tuscan. It was deep, dark and delicious. Truly awesome! Standing Stone is one of my favorite Finger Lake wineries. Standing Stone Vidal Ice is the name they use, not Ice Wine. They pick the grapes after the leaves are gone, and the grapes are drying and starting to shrivel - very important to concentrate and enrich the flavors. They freeze the grapes commercially, making sure they are frozen solid, which is critical to the ultimate wine quality. They ferment very carefully, using a blend of yeasts, and just the right temperature to keep the fermentation going strong. The apricot comes across on the nose as promised. There's also pineapple and honey. And there is nice acidity, so important in a good, well balanced dessert wine. Golden and rich, also with touches of rasin, make this an exceptional thick and delicious dessert wine. Fabulous!!!! Standing Stone just released their 2007 Vidal Ice was just released, but the 2001, 2002 and 2004 vintages all received 90 scores in the Wine Spectator Magazine. A fabulous dinner, with wonderful company, great food, and capped off with a tremendous wine! Paumanok Assemblage 2004 - Wow! As you know by now, I do not race out to review the most recent vintage. Rather, I tend to like older wines. However, Sunday was a nice day to try out something a little different - Paumanok Assemblage 2004. Now, it was a beautiful day throughout the Hudson Valley. Wanna know how know that? because I was forced to run errands that took me from the north end of the Valley to just below the mid point. I spent hours riding around in a truck, picking up fruit lugs (those large plastic trays that are used for harvesting small fruits - mostly berry fruits - raspberries, blueberries, grapes, currents, etc.). I left the house about 8:30 a.m. and returned around 3:30 in the afternoon, having to miss most of the 1pm football games. Unfortunately, I fared little better on the second set of 4pm games. I missed most of them too! Upon my return, there were farm chores to perform. I am no longer a consumer driven suburbanite. I am now a Jeffersonian agrarian hero....at least in my own mind. Although, I wished I weren't this past Sunday. It was gorgeous outside. The hilly roads of the valley are bursting with farm markets sporting pumpkin's and hay bales. You can see in the forests the beginning of change in the colors of the trees. The air is cold and crisp in the morning, and you need a robe or fleece when you come down for your morning coffee. So it wasn't all awful, between lifting hundreds of fruit totes up and down, preparing for the fall harvest. Dominique had planned a fabulous dinner. She made a Vichyssoise a classic French Potato Leek soup. And then we had a pork roast studded with garlic, homemade apple compote, and steamed Brussels sprouts with butter and salt and pepper. For this I needed something special. Enter Paumanok. 2004 ASSEMBLAGE WINEMAKER NOTES...The summer of 2004 was long and hot. This resulted in clean, unblemished, very ripe fruit. 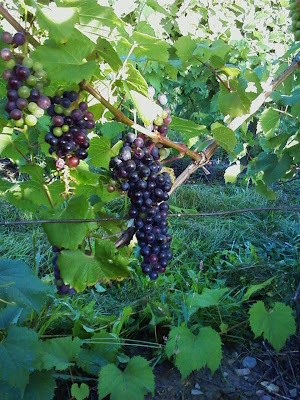 Thanks to meticulous and exhaustive (four passes) fruit-thinning, the grapes reached optimum ripeness. Average yields were 1.75 to 2 tons per acre. The grapes were sent through the crusher-destemmer with the rollers set wide apart to retain a larger number of whole berries. 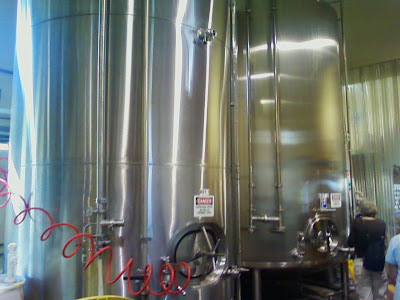 The grapes were fermented in stainless steel tanks after 3 days of cold soaking. Pump overs were done with splashing of the free run and then gently irrigating the cap. This method insures that only the softest tannins are extracted. After the fermentation was complete, the free run was drained into oak barrels. The must was pressed and, after clarification, was also moved to oak barrels. The malolactic fermentation was completed in the barrels. After 14 months in the barrels the ASSEMBLAGE was bottled. We poured the wine and swirled it in our glasses. The boys rolled their eyes and told my wife they didn't eat Brussels sprouts. We sighed, and tried to enjoy the moment for just a second. The wine was deep and dark. Nice berry fruits. A nice touch of black cherry. A long, smooth, dry finish. Lovely tannins. Great structure. And just enough pucker at the end. An impressive, impressive wine. It has definitely improved with age. A very, very nice blend. Wow! 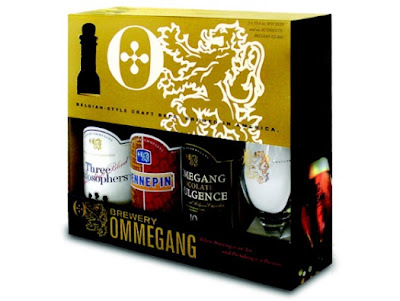 Normally I don't write about beer on this blog, but then again, Ommegamg is not a normal beer. OK, let’s stop right there. This piece is about Belgian-style ale. The foodies. The beer nuts. The high brows. You’ll be interested. 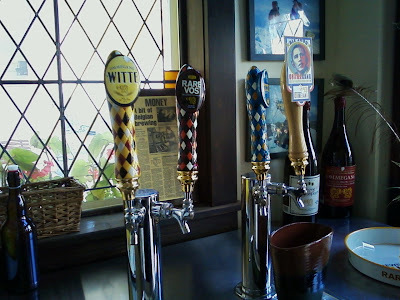 Those of you who are open to the microbrew options…some of you will come along…already have. The rest – this blog’s not for you. I love Belgian styled ales. 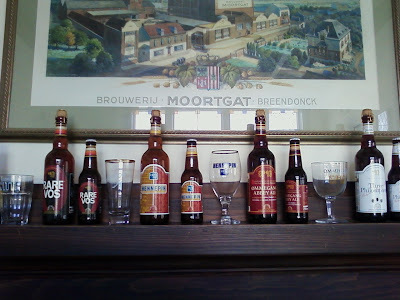 I loved Trappist ales. 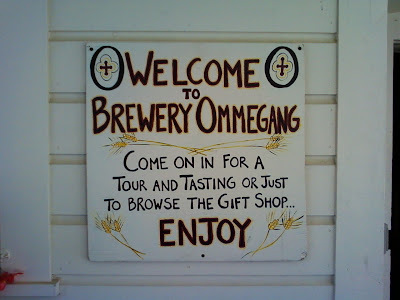 If you are with me, then Ommegang is heaven. 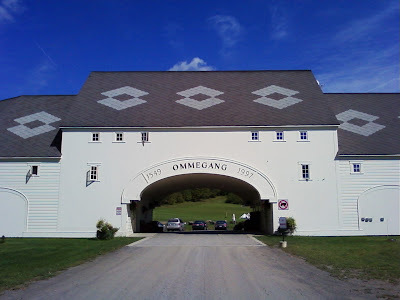 During our trip to Cooperstown, we went for a tour of Ommegang. 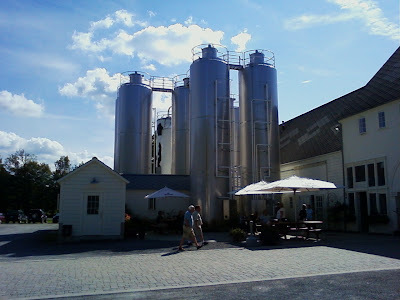 It was a brewery owned half by an American couple who built it and established it. In 2005 Duvel, who owned the other 50%, bought the company out, an now owns is solely. 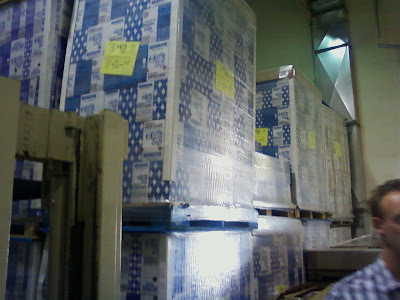 These are beers thar are aged before they send them out to market. These are ales you buy to store in your cellar for two three four or five years. I’ve had ten year-old ales that were smashing! Oemmgang is an incredible visit. 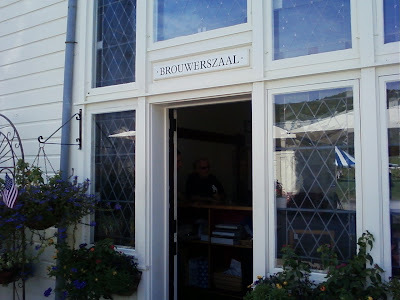 The brewery is constructed just like a Belgian brewery, with ingredients going into the farm house at one end, and cases of beer coming out the other. 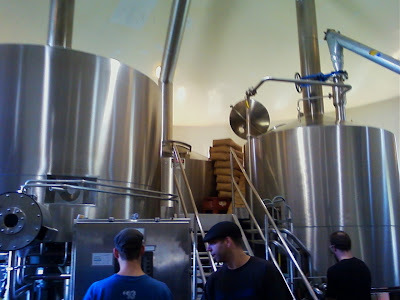 A brewery is very much like a winery…hoses everywhere. Smells of fermentation, lost of other weird smells, etc. 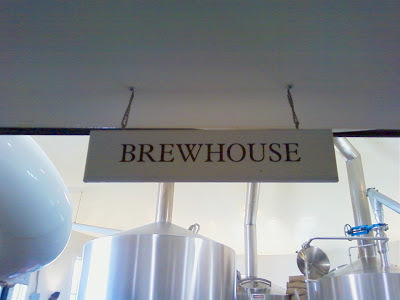 We went through the tour, as the cellar master was brewing a batch. 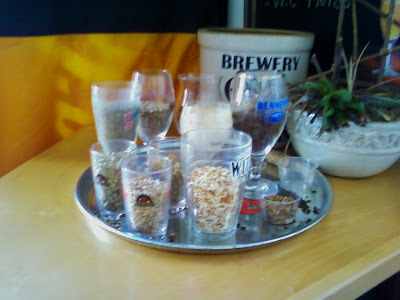 We were given a glimpse of the spice area, as these beers are made with many seasonings. They are complicated elixirs. 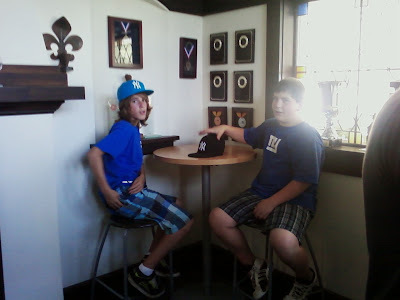 Our sons were not avid about taking the tour, but soon thought it was cool. And then we did a tasting at the end. And we also tasted some Omegang cheese spreads as well. Heaven! Loved all the beers…spicey, flavorful, big, robust. Their Wit is exceptional for those who love wheat styled beer. Everything else also great. The great hybridizers of the world, D.E. Grant, Alexander Caywood, Robert Underhill, Maurice Baco, and Alfred Siebel all found a champion in Philip Wagner. Wagner, when he wasn’t editor of the newspaper the Baltimore Sun (a small job, no doubt), was a grape grower and winemaker. His writings and books influenced generations of winemakers and vineyard owners in the Northeast and many other states around the country save the west coast. In the 1940s, 50s, and 60s, it was Wagner’s clarion call to the benefits of hybridized grapes that helped firmly re-establish wine making east of the Rockies. Hybrids were easier to grow – they were known for huge production, were prone to far fewer diseases than many other kinds of more traditional grapes, and they made passable wine. On the down side, single varietals of hybrids named for their grapes featured names foreign to most wine buyers, such as Catawba, Niagara, Diamond, DeChaunac, Chelois, Seyval Blanc, Chancellor, and Baco Noir. It took generations of winemakers to understand how to mold many of these grapes into drinkable wines. And many of the wines were better suited to sweeter, more popular fare, rather than the dry, austere, classic wines most people of European descent were familiar with. Also, with the costs of running a small, boutique winery already high, the hybrids did not command the higher prices as their noble European cousins, thus insuring a volume driven business. However, what made Wagner so popular, especially in the east, was that his tips, tricks, and techniques made it possible to make wine in regions that for centuries had frustrated those who tried it using noble grapes. Then came along Dr. Konstantin Frank. Frank had come from Russia, where in cold climates, he had experience raising and caring for vinifera in extreme weather climates. He stated emphatically that it was indeed possible not only to grow vinifera grapes in these regions, but also to make good wines from them. Vinifera had the benefit of having names that were well known to consumers, such as Cabernet Sauvignon, Chardonnay, Merlot, Sauvignon Blanc, Cabernet Franc, and others. They made excellent wines that had been part of wine making traditions that stretched back centuries in Europe, they cellared well, cellared well, and commanded high prices. While the Ivy Leaguers at Cornell snubbed him, offering him a job only as a janitor, Charles Fourinier of Gold Seal offered him a job. Frank proved his metal and his point. 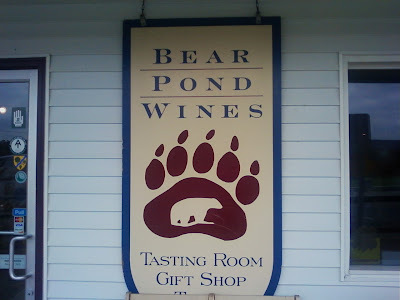 He made wonderful award winning wines at Gold Seal before taking the plunge in the Finger Lakes on his own. With the success of Frank’s Rieslings and Pinot Noirs, he established the rise of vinifera winemaking in the United States east of the Rockies. And his tips and techniques were improved upon by growers and winemakers like Herman J. Wiemer. Then over a generation or two of time, many of Wagner’s followers vineyards were ripped out, and soon Frank’s vinifera were growing in their place. Catawbas and Niagara gave way to Chardonnay and Merlot. When I first started really tasting east coast wines I struggled with their choices of grapes, aware of the weather concerns and regional growing problems, but Chambourcin? Chancellor? Baco Noir? What were these grapes? 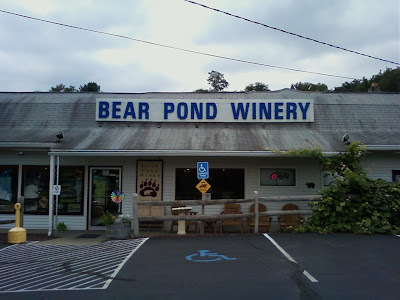 I have to admit, however, that it struck me just as odd – who needs a Cabernet Franc from New Jersey (Silver Decoy and Hopewell Valley just cover your ears)? I have even heard wine store owners themselves ask the question: "Without any disrespect, why do I need a new York Merlot or Cabernet Sauvignon, when I can get them from California and Chile, at better prices?" Thus is the east challenged. Today, there is a rebirth, however slight, in hybrids. And there is a resurgence in interest in heirloom grapes and the new strains of clones coming from Minnesota and to a lesser extent Cornell. As new regions emerge, they look for grapes to claim as their own, bringing a signature to the region. California has claimed big reds like Cabernet Sauvignon and Zinfandel, and Chardonnays. Washington and Oregon have claimed Pinot Noir. 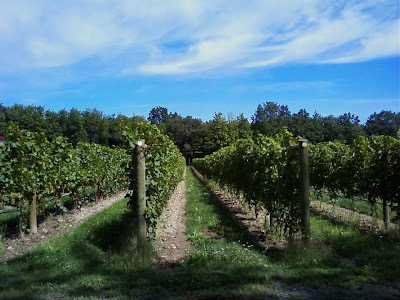 The Finger Lakes have Riesling, Gewurtztraminer and Cab Franc. Long Island, once known for chardonnay, now claims Merlot and Sauvignon Blanc. Even Virginia has established Norton and Viognier! 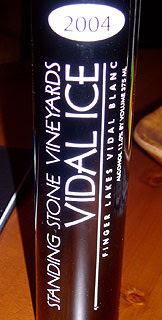 The northeast has long held Vidal Blanc as its own, especially in states such as Connecticut and Rhode Island and numerous other wineries. Sakonnet’s Vidal Blanc is as lovely a white table wine as I have had. The Hudson Valley is claiming Seyval Blanc as its signature white, but as of this writing, a consensus red wine of the region is still very much in the air…although Baco Noir seems to be making a case for itself. But as the burgeoning regions vie for a competitive place on the shelves as well as at festivals, and for marketing of a region or AVA, what grapes are out there to claim? Frontenac makes an excellent port. Many wineries in Minnesoata and Michigan are racing toward it. Many are scrambling for Noiret, but which region will claim it for its own? Dornfelder? Few have risen to the bait. But what else is still out there? Pinot clones? Gamay clones? Cab franc clones? This is where heirloom grapes and older hybrids come into play. Chelois? DeChaunac? Chancellor? Leon Millot? Chambourcin? Some of these grapes did not fare well against more classic varietals in the past, but winemaking on the east coast has also improved immensely. What could be made of those grapes now? Could one of those grapes, or a meritage of those grapes be the winning ticket for some winery? Some region? Certainly I have tasted some good hybrids recently. Clove Hill in Pennsylvania makes a good Chancellor. Crooked Lake Chancellor 2005 from the Finger Lakes was very good. The same goes for Deer Run Winery Corot Noir 2007. Certainly, one of my favorite red wines on the entire east coast, Benmarl’s Baco Noir, is the biggest reason for some to take seriously hybrids again. Will the bloggers and wine writers be open to serious red hybrids? Time will tell. They are curious if not snobbish. But curiosity is all one needs – for both the winemaker and the reviewer/customer. If the wine is good, eventually, they will come. If there is a commitment to making good wine, then reviews and word of mouth will help. Certainly blends are an idea, most interesting to me is Thirsty Owl Lot 99 which is a blend of the hybrid Chancellor and of the vinifera Pinot Noir. I think it is one of the best red wines being made in the Finger Lakes today. Could this be a trend? Possibly. I like it. There’s Tim Moore’s 2006 Change, from the Finger Lakes. It’s a dry red table wine made from Cabernet Franc and Corot Noir. 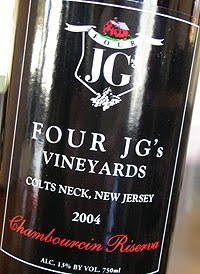 In New Jersey, there is Four JG's Chambourcin Riserva which is a delicate blend of Chambourcin and Cabernet Franc, which won awards in San Francisco and Los Angeles. Winemakers are looking for that new flavor. That new wine that will establish them. As far away as Australia there is something like Bunjurgen Estate Vineyards Pearl Destiny, a 2007 Chambourcin Shiraz blend. At Wineries Unlimited I saw the experimental stations choked with winemakers looking for new grapes to give them, and by extension their regions, an edge. I have talked with numerous winemakers, through out the east coast, about finding that new grape. They are all searching. Searching for that one wine that will establish them, and their region. And of course, one needs patience. Because really good red wines, especially in the east, come from vines at least 7 to 10 years of age, where the vines are digging their fingers deep into the dirt, and bringing up the real flavors of the terroir. 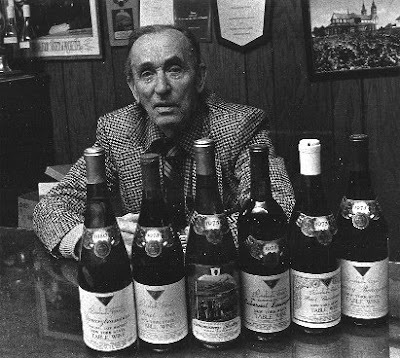 Dr. Konstantin Frank (1897-1985) was a viticulturist and winemaker in the Finger Lakes region of New York. He was born in Odessa, during the Russian Empire and received his PhD in viticulture from the University of Odessa, his thesis being on techniques for growing Vitis vinifera in a cold climate. After working for a time in then Soviet Georgia managing a large state-owned vineyard, he came to the United States in 1951. Frank, 54 years old at the time, brought his family with him. While working for the Cornell University Geneva Experiment Station, he urged New York State winemakers to move away from French Hybrid grapes and Vitis labrusca, and instead plant Vitis vinifera, the traditional grapes of European winemakers. His ideas were ridiculed. The men who ran the Geneva Experiment Station, a Cornell agricultural extension, gave him a job only as a janitor. No one thought that vinifera would grow in the colder New York area. His advice and theories were ignored. Instead, he was told, to push his broom. So strident and vitriolic was Frank with his thoughts on vinifera vs. hybrids, that at one point, sub-station personnel discussed the possibility of having him committed to Willard State Mental Hospital. However, there was a man who was willing to give Dr. Frank’s theories a try. Charles Fournier, the cellar master and president of Gold Seal Winery champagne, one of America’s largest producers of the day, offered Dr. Frank a job. Fournier was a celebrated French winemaker from Veuve-Cliquot, before coming to America. At the time, Gold Seal was awash in hybrids, and Fournier and Philip M. Wagner were friends. However, Fournier was used to working with vinifera. If Frank could successfully grow Pinot Noir, Fournier reasoned, he would be able to duplicate his successes in France here in the U.S. and establish a level of quality here in the U.S. theretofore unknown in the world of sparkling wine. Frank and Fournier went to work, and in a few years he was able to successfully cultivate vinifera in the Finger Lakes region. The two got along well together. Frank spoke German and French fluently, and so the two chatted away in French. Frank spoke English only reluctantly. He planted and experimented with Riesling, Chardonnay, Pinot Noir, Gewurztraminer, Cabernet Sauvignon, and the exotic Rkatsiteli. Fournier was ecstatic! Frank was encouraged. After years of working with Fournier, Frank bought a parcel of land with money he had saved, on Keuka Lake, and began growing Pinot Noir grapes. 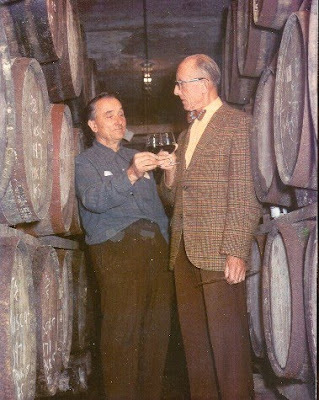 He established, in 1962, Dr. Konstantin Frank’s Vinifera Wine Cellar. 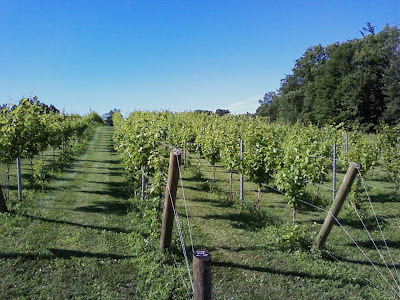 It was New York’s first, all-vinifera vineyard and winery. Despite his success, other winemakers still doubted him for many years and he had trouble getting New York distributors to handle his wine. Frank was a singular individual, iconoclastic and cantankerous, he did not suffer fools nor the non-believers well. He could be rude and sometimes impetuous. He could be tactless. While on his crusade, he went out of his way, according to amateur historian and winemaker Ken Liftshitz, of Silver Stream Vineyards, in October of 1963, while still working for Fouriner, to oppose hybrids. He gave a lecture in Buffalo wherein he insisted on the banning of hybrid grapes. Frank’s remarks were sparked by the French movement of that time to ban hybrids from grape production in certain parts of France. But hybrids were then the backbone of the industry, even as prices were falling for hybrid grapes. The war between Frank and Wagner was on. By publicly calling on for a ban on hybrids, Frank had broken the social contract by asking for the banning of another man’s livelihood. Especially he man who had saved east coast grape growing and wine making. Lifshitz also wrote, “Several less than rigorous experiments were undertaken to show that these were toxic among these, the feeding of hybrid wine juice to chicken and pigeons. There was as result an increase in birth defects. Certainly these could have been attributed to the alcohol content of the wine as easily as the genus but Frank continually cited these as evidence that the varieties were toxic. However, Frank was a man who was willing to pass down his knowledge to anyone who wanted. So famed was the vineyard and Frank’s work that Robert Mondavi paid a visit before opening his own winery. 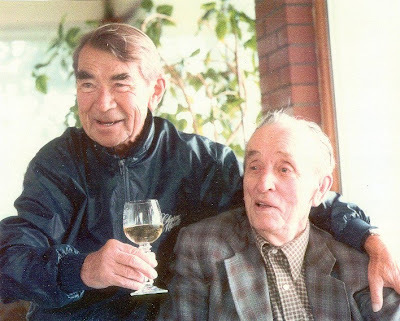 Another one of those who paid heed was Herman J. Weimer, who eventually, following Frank’s lead, followed suit, making world class Rieslings and Gewurztraminers. Frank had many good friends during his lifetime, despite his quixotic ways, and was in fact good friends with Andre Tchelistcheff, the renowned and celebrated Russian-born émigré winemaker (who had made a name for himself in France) in California at Beaulieu Vineyard. He died at the age of 88, in 1985. 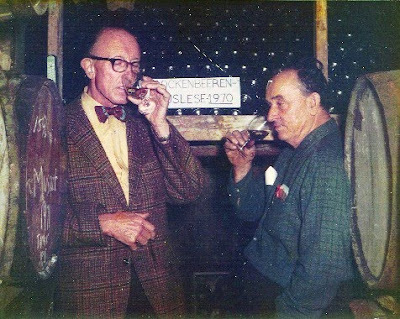 While Dr. Frank’s wines eventually gained a good reputation within the industry, no one could repay him for his gift of vinifera. It was at this time, that his son, Willie, took over his father’s business, restored the vineyards and wine cellars, linked it with his own Chateau Frank sparkling wine label, that Dr. Konstantin Frank Vinifera Wine Cellars vaulted to the prominence it enjoys today. Today, Dr. Frank is recognized as having led the revolution in wine quality in New York State and the East Coast. In 2001, the Vinifera Wine Cellars, under direction of his son, Willy Frank, won the first "Winery of the Year Award" from the 2001 New York Wine & Food Classic competition held at the Hudson River Club in Manhattan. Dr. Frank, in short, is the Prometheus of east coast winemaking, having given vintners east of the Mississippi, the opportunity to grow vinifera of all kinds, as well as plant other varietals in cold weather climbs, using his theories and ideas. He was easily among the giants in 20th century winemaking. p.s. Thanks to Ken Lifshitz for his background work on Frank, and point to his research, 'Down by our Vineyard', Kenneth Lifshitz, pp. 80-97, www.kenlifshitz.com, 2004. Philip Wagner was one of the most influential winemakers in 20th century America, providing information and tips to generations of would be winemakers through his numerous publications. He was also, by coincidence, the father of the hybrid movement on the East Coast. According to Cornell University Library, Philip Marshall Wagner was born in New Haven, Connecticut in 1904, and grew up in Ann Arbor, Michigan, where his father was Professor of Romance languages at the University of Michigan. He received an A.B. degree from the University of Michigan in 1925, and worked in the publicity department of the General Electric Company in Schenectady, New York, from 1925 to 1930. In 1930 he moved to Baltimore, Maryland, where he began work at the Baltimore Sun newspapers. He was editorial writer for The Sun 1930-1936, London correspondent for The Sun 1936-1937, editor of the editorial page of The Evening Sun until 1943, then The Sun until 1964. For decades he presented cogent facts and well-presented arguments for millions of Americans around the beltway and throughout Maryland. He influenced opinion and thought at the highest levels. “He joined The Baltimore Sun in 1930 as an editorial writer. In 1938, he succeeded H. L. Mencken as editor of the paper's editorial page. One of Mr. Wagner's first articles on American wines appeared in 1933 in The American Mercury, Mr. Mencken's magazine. Mr. Wagner became The Sun's chief editorial writer in 1943. He retired in 1964 but continued to write articles on wine and public affairs,” wrote Frank Prial in the New York Times. However, more important to this biographer, his interest in grapes and winemaking is evident in a photograph circa 1910 showing him attempting to work a basket press. He became seriously involved in vineyard cultivation and winemaking after moving to Baltimore during Prohibition. In 1932 he rented a property in Riderwood, Maryland that had the remains of a twenty vine vineyard. After working on the vineyard for a year, he purchased the property and planted his first vines. In 1933, his first book, American Wines and How to Make Them was published, and it was at the time the only available book on the subject in English. For a few years he experimented with grape varieties, and while on assignment in London he discovered the French hybrids during a visit to an agricultural station in East Malling. This led to his importing vines from Maurice Baco in 1938, which in turn led to the nursery that supplied stock for the thousands of Baco vines in the East today. 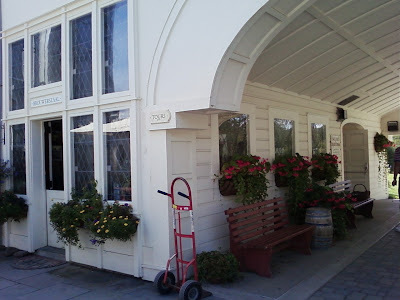 According to Prial, during Prohibition, as an amateur home winemaker, Wagner had failed to propagate the California vinifera that were the basis for his favorite classic wines. They did not survive the Eastern seaboard’s brutal climate. However, Wagner was determined to make his own wines, and making wines from American labrusca varieties such as Concord or Delaware resulted in wines that were repugnant to himself. It was in his frustration that Wagner turned to hybrids. In 1940, he and Jocelyn McDonough were married and formed a lifetime partnership, "J. and P. Wagner, Props.," subsequently expanding the Boordy Vineyard and establishing the Boordy Winery, the cornerstone for which was laid in 1943. In 1945, he published A Wine-Growers Guide. This volume became a crucial reference for grape growers in the East. Philip and Jocelyn traveled extensively to the wine growing regions of France, Spain, Italy, Portugal, Yugoslavia, and Russia in their search for disease-resistant varieties of grapes that would also be suited for cooler climates. 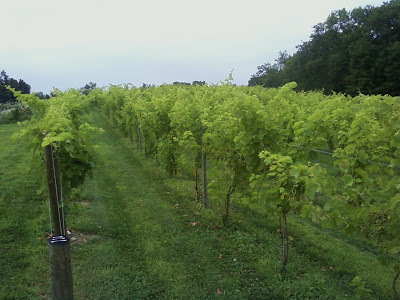 Wagner opened Boordy Vineyards, Maryland’s first winery, in 1945, in a parallel career, with various grape varieties at his five-acre vineyard just north of Baltimore. 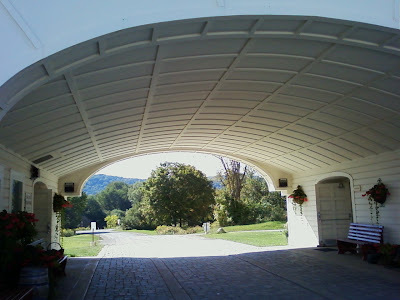 “It was, he said, America's first winery dedicated to producing wines from French-American hybrid grapes,” wrote Prial. ''It was not long before connoisseurs in New York and Washington learned that entirely new kinds of wines were being made in Maryland,'' Leon D. Adams, the wine historian, noted in his book ''The Wines of America.'' 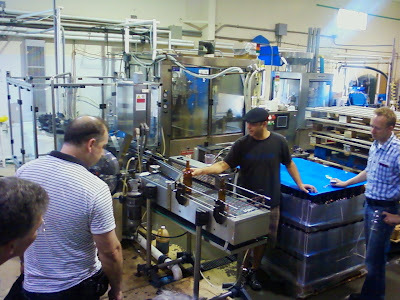 At their peak, Boordy’s was producing about 8,000 gallons of wine a year. Wagner’s books sold countless thousands, as would be winemakers all over the country read his books and articles, and he helped lead them on a journey to discoer the fun and excitement of making one’s own wines. Few American winemakers did not have at leat one, if not several, of his books on their shelves. The Wagners sold the Boordy name and equipment in 1980, but kept the nursery to supply their hybrid vines to growers nationwide. He died from emphysema and heart failure on Sunday, December 29, 1996 at his home in Riderwood, Md. He was 92. Wagner had helped make wine making easier and by handing down hybrids, allowed grape growers to grow grapes the could make wine with, that would grow in their region, and help gain a better footing on understanding the growing of grapes, helping to grapple with the region’s weather patterns and disease issues. In short, he gave them a head start on learning more about their terroir, which was not a term commonly used among winemakers in those days. 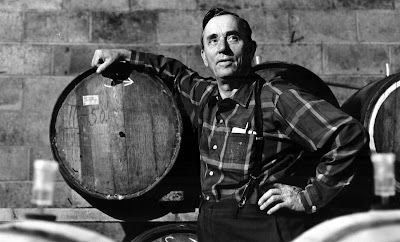 Today’s east coast and mid-west winemakers owe a great deal to Philip Wagner, yet few know his name. Programs like Cornell’s and Minnesota’s hybridizing programs owe a lot to Wagner’s insistence that hybrids were a reliable and valuable resource for grapes that would make quality wines. And evidently, many still agree with Wagner’s viewpoint, as these programs turn our more and more new strains that grape growers and winemakers consistently work with. WHAT: Maryland Department of Agriculture Secretary Buddy Hance will present the Governor's Cup Trophy to Sarah O'Herron and Ed Boyce of Black Ankle Vineyards. WHY: Black Ankle's 2007 Crumbling Rock one the 20th Annual Governor's Cup Competition—the second year in a row this wine has been named "Best in Show"
WHEN: Tuesday, September 15, 2009, 2-2:30 p.m.
For more information, call the Maryland Wineries Association at 410-252-WINE. So, we're officially on our way through the Cooperstown Beverage Trail, on the way to the Baseball Hall of Fame. Me. Dominque. And my two sons, Dylan and Dawson. After a stop at Howe Caverns (which was very cool), we drove on I-88 to the appropriate exit, and turned. We were all famished. We hadn't eaten in a while, and I didn't want to taste on an empty stomach. 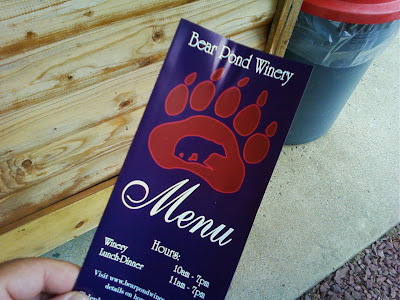 So we were on the prowl for something to eat...when my sons spotted a burger place...it turned out to be Bear Pond Winery. They have a separate burger shack! We ordered up and the food was great! Dawson and I both ordered 1/3 pound Mama Bear Burgers, which are double patty, double cheese burgers with lettuce, tomato, and onion. They were fantastic!!! I highly, highly recommend the food at the shack. 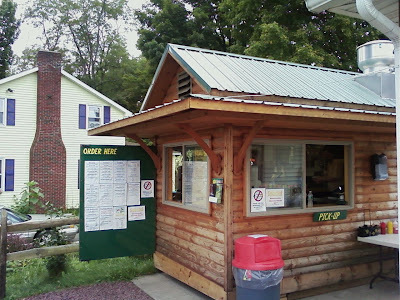 The french fries, panini, and chili dogs were awesome too! 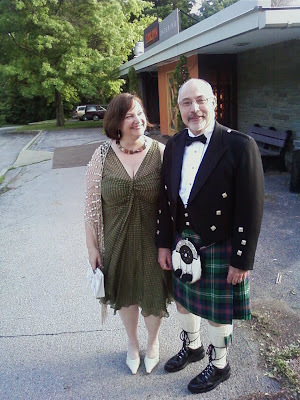 Mark and Brenda Lebo are the owners. 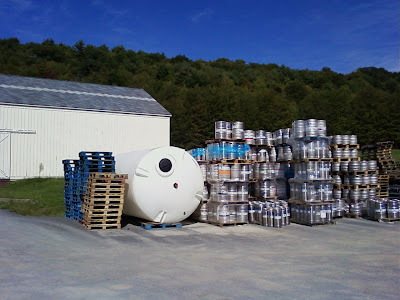 The winery is right on the highway to Cooperstown - you can't miss it. 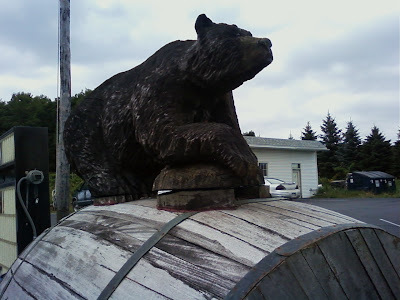 Especially with the wood carved bear striding atop the barrel out by the road. Mark and Brenda bought the place about five years ago. And they've been building up the winery every year. They have a new winemaking building, new tanks, new bottling machine, new forklift...and lots of gallons of wine! Once inside, we were well treated very nicely by Megan, our tastingroom person. She was great! Dom and I tried six wines each. Some the same, some different. The chardonnay was nice. And so was the seyval blanc. But the real winners for us were the reds and the dessert wines. First off was the Silver Tip Merlot. This is actually a blend of Merlot with a touch of Seyval in it. It made for a very lovely, dry, dark rose. A great idea and a fabulous wine! This is something worth searching for. Bought several bottles. Bruiser is the bomb! A deep, dark dessert wine. Very much like a port, but not as heavy and not quite as high on the alchol. 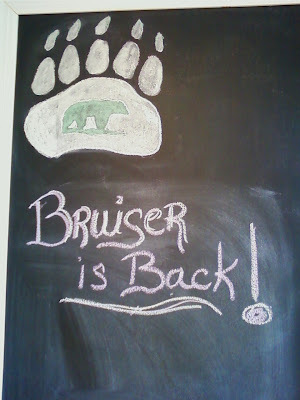 Bruiser is a special blend of Black and Blue berries for a unique sweet complex flavor. This was a fabulous wine. We bought two bottles. Might try and sneak back to get another one before we leave. 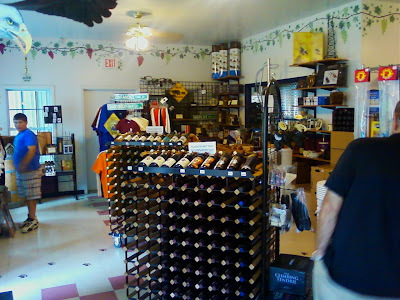 Also, Mark sells home winemaking and brewing equipment and supplies at the winery. Very cool. Mark gave us a tour of the winery and environs. It's a fast growing enterprise and well managed. I real find!